Black seed oil, that oil of many names with a pungent taste, scent and ability to heal the body! 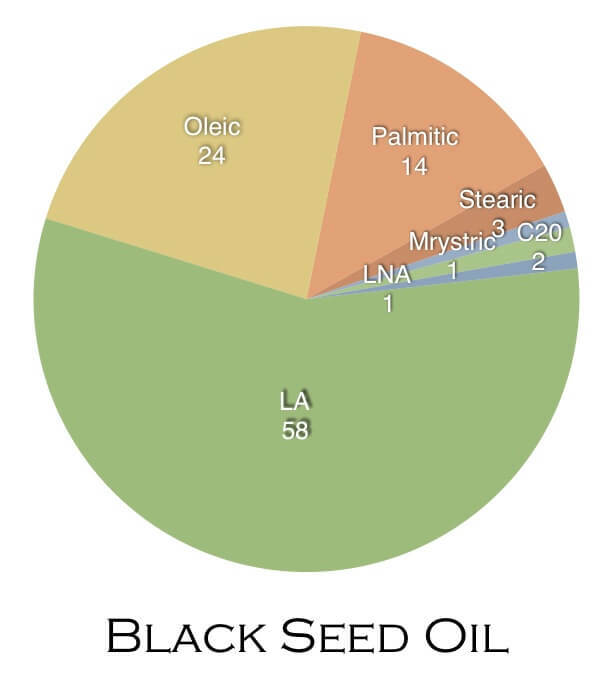 I’ve known about black seed oil for many years and have ordered from many different sources over the years. Recently I ordered black seed oil from a new source as my supply was running low. 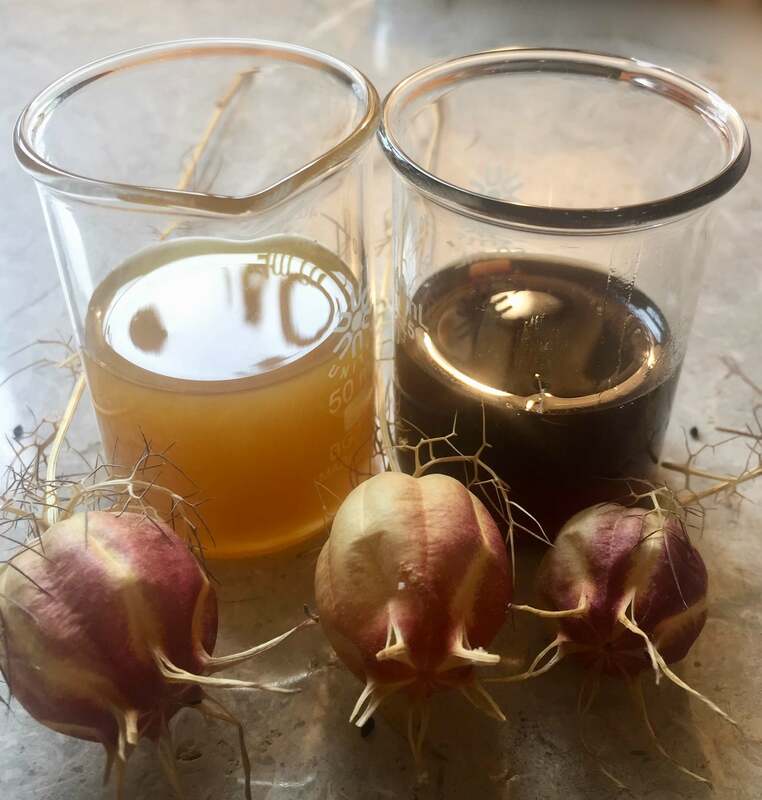 I ordered from the same supplier as I had before, but what I got was very different, as can happen between different seasons and pressings with the seed oils. The oil I got last week was powerfully dark and almost syrupy in look and feel. This was strikingly different from the pale colored oil I had gotten before. I had a little left from the old bottle and so I compared them side by side. In the image below, you can see the old shipment on the left and the new shipment on the right. The new oil, though strikingly different in color and texture, still has the peppery taste that I've come to know with black seed oil. Both versions are good, well sourced oils. This is just one example of how much variety we find in the fixed oils. Different crops, different years, different amounts of refinement all contribute to this. This recent shipment is a little harder to use, less neutral and so I dilute it more with other fixed oils, but I know it's good because the dark, rich color and texture can only mean that it has a lot of the unsaponifiable healing fraction in tact! Yet it is not of any of these other named plants, onions, cumin, caraway, or coriander. I have a friend who calls the seeds velvet seeds as that is the best physical description of them! They do look like perfectly black and very velvet little nuggets. But the botanical name for the plant is Nigella sativa, one of several varieties of the the larger buttercup family, Ranunculaceae a huge family of 43 genera that includes clematis, anemones, hellebores, and of course buttercups! If this sounds familiar these are the Love in a Mist flowers often used in dry arrangements. A seed found in ancient Egyptian tombs including Tutankhamen’s signifies both nigella’s antiquity and its importance in Egyptian culture, as only items and foods that would assist the pharaoh in the afterlife were placed in his tomb. Black seed oil is said to be so powerful it can cure any ailment except death. And while this might be a tiny bit of a stretch, I can attest to it's powerful cold fighting properties. So just what does black seed do for us, and for our skin? The seed oil is highly aromatic which indicates that it is an abundant source of a number of plant based active compounds including thymoquinone, thymohydroquinone, dithymoquinone, thymol, carvacrol, nigellimine-N-oxide, nigellicine, nigellidine and alpha-hederin. So in words that we can understand, the oil is antimicrobial, antiviral, antiparasitic, antifungal, plus it helps speed wound healing. In addition it is anti inflammatory and helps calm and treat the challenges of psoriasis, eczema and the skin conditions of rosacea and acne! The oil is high in omega 6 linoleic acid, a polyunsaturated fatty acid that helps to take its healing unsaponifiables deep into the skin layers. Used in formulas for skin therapies the oil will help provide a high degree of nourishment in the form of vitamins and minerals including zinc, calcium, folacin, iron, copper, phosphorus, riboflavin, thiamin, pyridoxine, and carotenes. You can also use black seed oil internally. My recent bout with a head cold and loss of my voice improved rapidly once my most recent order of black seed oil arrived on my doorstep and I started taking it. And the best way to take this pungent oil internally? A good squirt or teaspoon full in fresh squeezed orange juice. 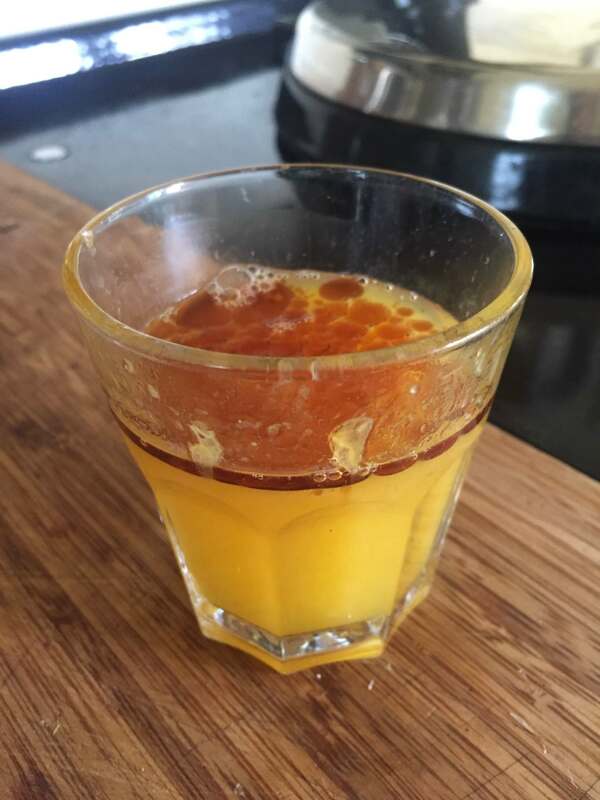 The pungency perfectly balances the sweetness of the orange juice and they make an interesting drink! Where do you purchase this oil? Thanks. Wanda, I got mine from J. Edwards but you can google black seed oil and find some good sources. Also in the Facebook group in the files there is a document that has sources world wide. 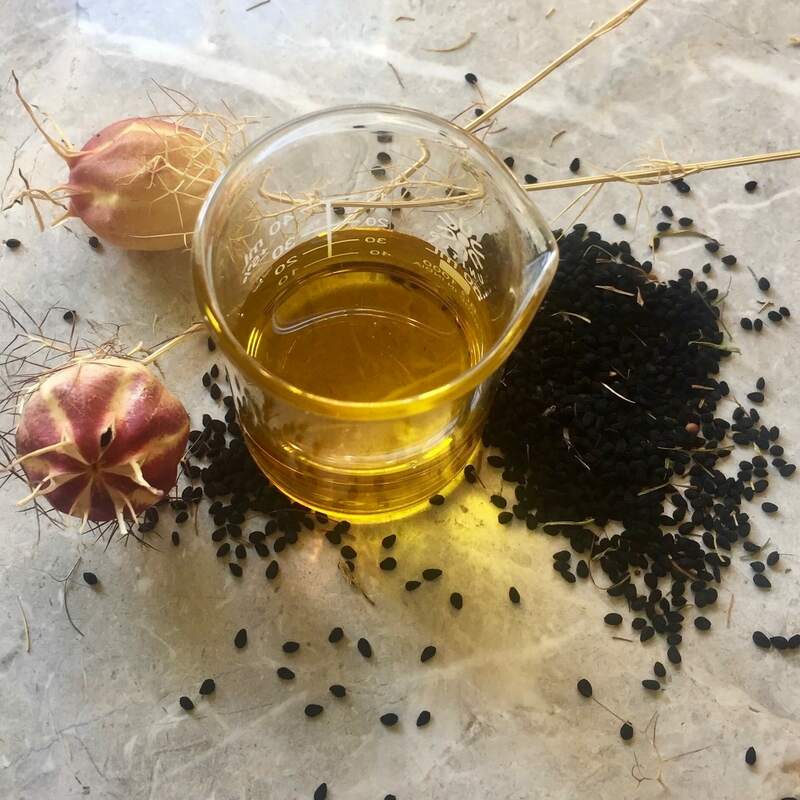 Thank you Susan ,I find this post very interesting,hearing that we can also have a black seed oil.I have known that for a couple of years,but I only use it on cookies as a decorative aspect.Funny is that I have plenty of that ,the common name being fennel,in my garden.And nice way to take it daily. At the moment I will buy some to start with my black seed oil. I liked the healing power of this amazing seeds. it is so interesting that it heals every ailment except death. The 02 extremely different colors may be due to two different extraction methods. The one on the left looks like it’s cold-pressed and the one on the right looks like it’s expeller-pressed.